Just imagine about the boatloads of young readers this summer sitting down to read … a full-length play. 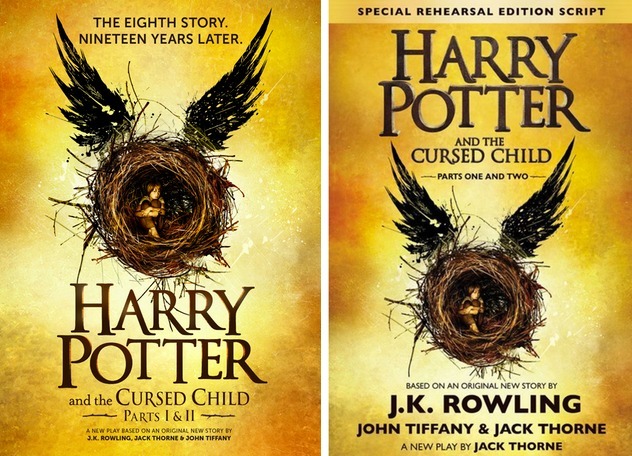 That’s the text format of Harry Potter and the Cursed Child, the latest story set in J.K. Rowling’s world of wizardry. I am both pleased with the decision to use the drama/theater format, and also, I am a bit worried that it will turn kids off from the book (my son started it and stopped, saying he didn’t want to read a play). Still, the book is a great opportunity to expose readers to the ways in which live productions are created (the book is script to the play now on stage, and is labelled Special Rehearsal Edition Script) and written, and sustaining the story throughout an entire book-length play forces the reader to imagine the stage itself, with actors and props and effects. I know many of us do this with novels, too, but here, it is explicit, with stage direction as text. Does the story hold up? Sort of. The beginning feels a bit slow, with many familiar themes emerging, as Harry and Ginny are now parents, and one of their boys, Albus Severus Potter, is off to Hogwarts. Albus feels different from the family, and finds a friend in Scorpius, the son of Draco Malfoy. The two boys get themselves into a world of trouble soon enough, and the return of Voldemort might be imminent, as a result. I won’t go into the story too much, so as not to ruin it, but suffice it to say that the second half of the book found its footing and was quite entertaining, I think, as it broke away from echoes of the past Harry Potter tales. As a father, I was particularly attuned to the tension that Harry feels with Albus, and the difficulties that the son and father have with each other, acknowledging the imperfect resolution of their relationship at the end of the story. I’m not sure how much that theme will resonate with young readers. One never knows. This new book doesn’t quite match the storytelling flair of other books in the series, in my opinion, but then, that probably wasn’t the intention of publishing Harry Potter and the Cursed Child as a play in the first place. In fact, Rowling is not even the listed playwright (that would be Jack Thorne). Instead, the book is “based on an original new story by J.K. Rowling,” although she clearly was integral to the development of the project (as noted by her presence in the back pages of the book). This fact is listed in huge letters on the cover, so the publisher was not trying to pull one over on the audience. Harry Potter and the Cursed Child is worth the read, if you come in with realistic expectations. And who knows? Maybe some readers will use the script and start planning their own productions. Wouldn’t that be cool? Agreed, the story did initially move pretty freaking slow. Anytime I notice that though in a book I also assume that whatever it leads up to will be worth the wait. However, its seems that thematically this book was a bit different than the others. In any event, I enjoyed it nonetheless. I don’t think their’s another book series that has ever inspired as much controversy as Harry Potter. And I’m sure I’ll buy whatever comes out next!